As anyone who has been to the world’s most famous regatta knows, Henley has many aspects of uniqueness. One of those is the way the entire operation runs seamlessly, perhaps invisibly, for competitors and spectators alike. None of that happens without a lot of work that goes on quietly behind the scenes. 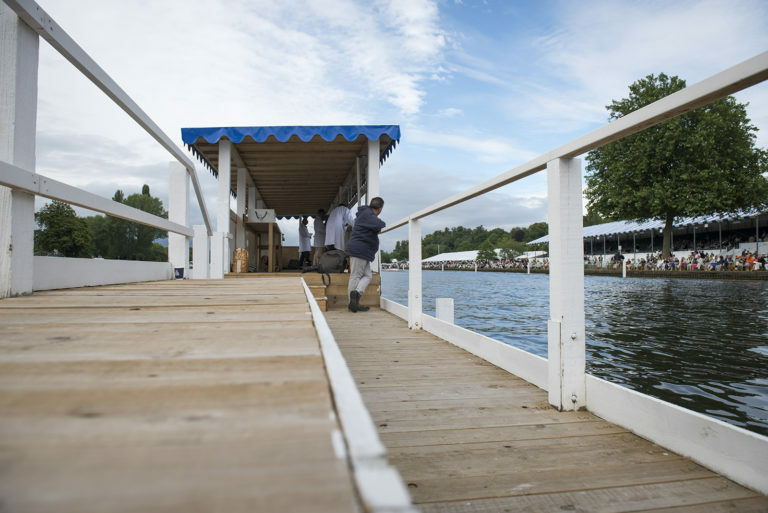 The Regatta has a professional team of full-time and seasonal staff who work under the broad direction of the Stewards’ Committee of Management; they are joined by volunteers in the run up to the Regatta and throughout the week. I’ve been privileged to be one of those helpers, in my case being responsible for proof-reading the daily programme. Each day there is a freshly-printed programme containing the timetable of racing and the details of all the crew competing, along with the results of the previous days’ racing, the draw chart, and a host of other information. Being Henley, this has to be to ‘Regatta standard’, which basically requires it to be perfect. That standard means that every person’s details have to be checked to ensure a complete set of initials, and the spelling of their name is correct. The date of birth is required in order to create a unique record – it has been known for a coach to put down any old date only for it to be queried when it otherwise looks like someone who has competed before! Foreign names of clubs and competitors require care to ensure accents and shortened forms are correct. Club colours are checked, some change them, and others may be new clubs to the Regatta. Only once crews have weighed in, and seat orders and steersmen confirmed is the crew ready for insertion in the daily programme. This makes it an organic task as crews arrive in Henley; those not competing until later in the week have to be tracked to ensure they are given the same care and attention. By Tuesday morning this information is ready for the Wednesday programme which is printed that afternoon. Once the Regatta is underway the bulk of the work is done in the evening after racing. Within a few minutes of the National Anthem the results pages and draw chart are coming over from the printers who have been preparing them throughout the day. Once the timetable for the following day has been finalised that is sent to the printers and later the first proof of that and the main pages with the crew details arrive. A small team of dedicated and hawk-eyed volunteers help me with the proof-reading. Working in pairs to ensure accuracy, everything is checked, from the smallest spelling corrections that may have been notified, to the big picture of ensuring the right day and date and running order are correct. All this is done in an open office with others bringing back equipment or doing other tasks to close the day and prepare for the next. On Wednesday evening I hope to be able to call the printers by about 10.15pm to roll the presses, as the week goes on and the number of races reduces it gets earlier. With luck, Saturday evening can be all done by 8pm. This is all very good, but the stories are in what can go wrong or need a pause for consideration. How often, for example, is a dead heat not re-rowed on the same day? When that happens how does the result get displayed in the results pages? The answer was that we couldn’t find a precedent so you work out what seems right and go and see the Chairman to get it approved. When someone has to withdraw from competition after the Draw, how is that portrayed? That was relatively easy, the Chairman remembered when it had happened to him and you reach for the record books. Continuity of style is important, but sometimes changes occur. Did you notice that in 2017 ‘Holland’ was replaced with ‘Netherlands’ for the first time in the history of the Regatta? Why? Well ‘Holland’ is only a part of the country called ‘Netherlands’ and the latter is the correct form as well as being the style used by FISA and the IOC. Change?! you shout, well yes, just occasionally, and when it is the right thing to do. It gives great satisfaction to do something and get it right, and for a pedant like me that is important. Sometimes it can give others particular pleasure. A few years ago (I’ve been fortunate to be doing this job for nine regattas this year) I came back into the Secretary’s tent where I have a desk and one of the staff on reception warned me there was an irate lady waiting for me. Her son had been rowing in a school crew and his surname was incorrectly spelt in the programme. After apologising profusely I set about looking into why that was. It was an unusual name and the coach had written it on the entry form clearly but inaccurately. Since it was his first time competing there was no reason to query it. His mother was all for hanging the coach out to dry when I looked at the weighing-in sheet which had been signed by the competitors (who are asked to verify their name and initials for just this purpose). I commented that he had just won his race and so I would ensure it was corrected for the following day’s programme. The lady was so chuffed she brought me a bottle of champagne the following afternoon. That crew went on to win the Princess Elizabeth Cup that year and so it mattered even more that his name was now right as it is engraved on the base. I’d love to know who got the bigger blast from her, coach or son. Along the way there are other jobs that need to be done and fit with these other duties. Helping the Steward in charge of entries double-check the draw slips prior to going to the Town Hall for the Draw is a crucial task. Only those who have qualified, or did not need to, less any withdrawals and adding in anyone moved up as a result, separating selected crews which are drawn first, right event in the right envelope….. There’s a board facing the main entrance to the Stewards’ Enclosure that states the time racing begins the following day. Changing that late in the evening so it reads for the day after tomorrow is not too difficult, but there’s usually a member of the team who can be persuaded on Saturday night to go and put a time on there, just so long as I remember to take it off again before I go. There won’t be any racing on Monday, and early on Sunday that board will be removed by one of the grounds team. Detail, Henley style. 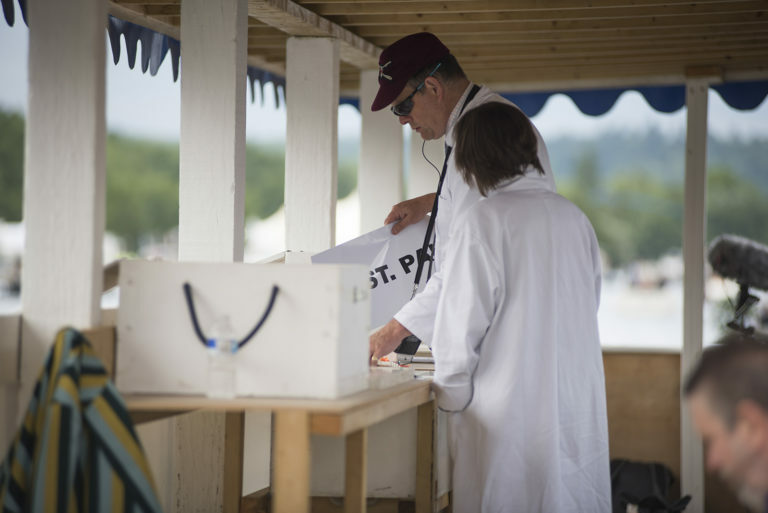 Some volunteers help in other areas once the Regatta is underway. For over 25 years now I’ve been a race reporter on the back of an umpire’s launch. This is the second best view of the race after the umpire and requires speed and accuracy, giving the key information back to the commentary team for broadcast. In the enclosures the voice you hear is not the person on the launch but someone else, away from engine noise and radio interference, and for the first two and a half days that team has to deal with two races on the course at a time. Now in this age of the television images it is even more important the reporting is swift and accurate. There is a separate team of commentators for the broadcast, but in the Stewards’ Enclosure spectators can see the screens but hear the general commentary. 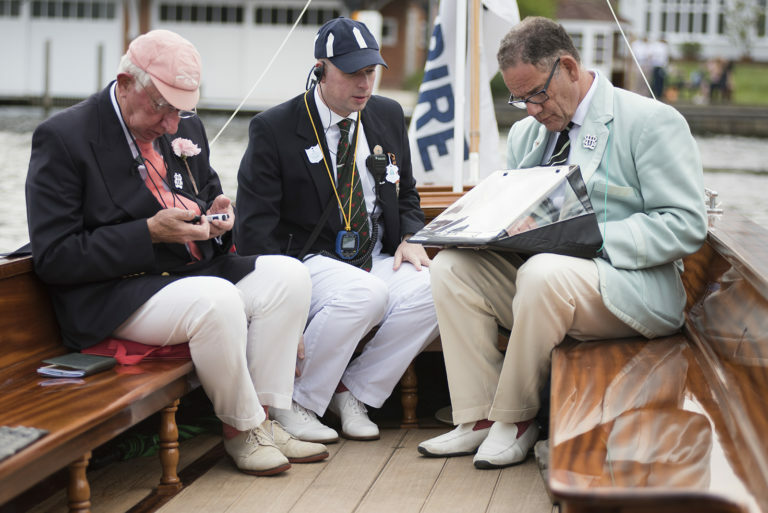 Photo A regatta race reporter with timekeepers on the umpires launch. More recently I have taken on arranging the Regatta Church Service. Did you know there was one? Well of course there is, this is Henley. 9.30am on Finals Day in the Parish Church. A short (40 minutes) service with a bit of singing and a jolly (usually) preacher. Normally, the details can be all done and dusted around Easter so the order of service can be printed. HQ likes to get things done in good time, it’s part of the great efficiency that pervades the whole operation. The church is filled with Stewards and their guests and other supporters of the Regatta, not to mention the locals whose usual service has been sort of usurped. Overseas schoolboy crews that have had the misfortune to be knocked out earlier in the Regatta then take the collection. By 10.30am everyone is in the enclosures drinking coffee or something stronger and waiting in anticipation of the first final to thunder down the course. On the Friday before the Regatta the qualifying races are held for those events that are oversubscribed. 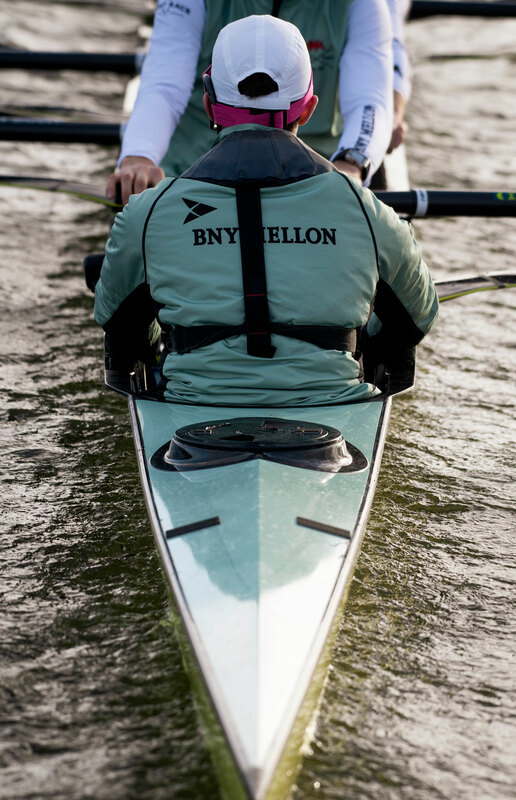 For many this will be the only time they race down the course, at least that year, but it is a great experience for them and part of what inspires people to strive to compete at Henley another year. Marshalling all those boats takes a large number of Stewards and volunteers over several hours on your feet, but who would rather be at work instead? Not me; it’s the start of HRR for another year and there’s nothing else I’d rather be doing for the next ten days.